Self adhesive magnets. Pack of 100 adhesive magnets. 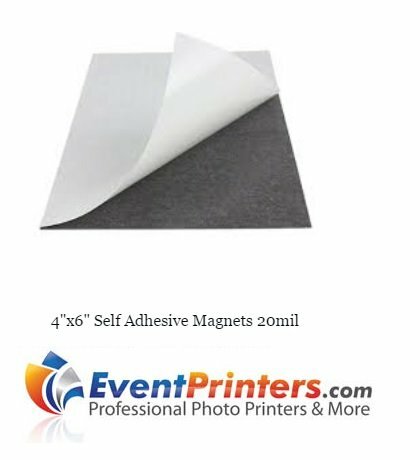 Each adhesive magnet sheet is 4" x 6" and 20 mil in thickness. Easy to cut with a sharp pair of scissors, a box knife or a table-top paper cutter. Perfect for photos, crafts, kids drawings, signs, graphics, and more! Very easy to use... Just remove the paper liner and place your photo! Flexible Magnets 4" x 6" Self Adhesive Magnets. Turn 4x6 photos into magnet. Pack of 100 self-adhesive magnets size 4"x6". PEEL & STICK: Just peel back the protective paper and place your photo, it's that easy! Flexible and easy to trim if needed. Cut easily to any size, for any project! Great for photos, DIY save the dates, kids drawing, party favors, file cabinets and more! Photo magnets are a great gift for any occasion. MAKE YOUR OWN SPECIAL REFRIGERATOR MAGNETS! Sheets can be cut into any size and mount securely to fridge, file cabinet and anything made of metal.